NATIONAL CHILDREN’S ALLIANCE (NCA) is the national association and accrediting body for a network of 795 Children’s Advocacy Centers—CACs. We provide support, advocacy, quality assurance, and national leadership for CACs, all to help support the important work that CACs do in communities across the country. CACs provide a coordinated, evidence-based response to child victims of abuse. Our mission is to promote and support communities in providing a coordinated investigation and comprehensive response to child victims of abuse through child advocacy centers and multidisciplinary teams. Why do children need Children’s Advocacy Centers? An estimated 1,564 children died from abuse and neglect in the United States in 20141, the most recent year for which there is national data. But child abuse fatalities are not the only consequences of abused children suffer. Sexual abuse, physical abuse, an neglect are forms of Adverse Childhood Experiences (ACEs) that researchers have linked to mental health problems, such as mood disorders, anxiety, substance abuse, and impulse control disorders.2 Child abuse often co-occurs with other ACEs, like witness to domestic or community violence, traumatic loss or separation, or sexual assault. Adults with multiple ACES have even been shown to be more likely to endure poor health outcomes like diabetes, STDs, heart disease, and early death. But Children’s Advocacy Centers help kids by providing them with justice and healing from their abuse in a child-friendly setting they can trust. In addition to helping collect forensic evidence to help law enforcement and CPS protect children from abusers, CACs coordinate a complete response to the needs of a child after abuse. Last year, CACs around the country served more than 311,000 child victims of abuse, providing forensic interviews, evidence-based mental health treatments that are proven to reduce symptoms, case management, victim advocacy services, and more. CACs are how communities mount a coordinated response to allegations of child abuse. To understand what a CAC is, you must understand what children face without one. Without a CAC, the child may end up having to tell the worst story of his or her life over and over again, to doctors, police, lawyers, therapists, investigators, judges, and others. They may not get the help they need to heal once the investigation is over, either. When police or child protective services believe a child is being abused, the child is brought to the CAC—a safe, child-focused environment—by a caregiver or other “safe” adult. At the CAC, the child tells their story once to a trained interviewer who knows the right questions to ask. Then, based on the interview, a multidisciplinary team (MDT) that includes medical professionals, law enforcement, mental health providers, prosecution, child protective services, victim advocates, and other professionals make decisions together about how to help the child. Finally, they offer a wide range of services like therapy, medical exams, courtroom preparation, victim advocacy, case management, and more. We know the services CACs provide work because the evidence shows it does. In a collaborative partnership among NCA, The Duke Endowment, Yale University, Children’s Advocacy Centers of North Carolina, and the South Carolina Network of Children’s Advocacy Centers, we launched an initiative to bring a promising, evidence-based treatment to children in the Carolinas who needed it. The Child & Family Traumatic Stress Intervention (CFTSI) has already demonstrated significant results. NCA will expand this important work in the coming years. In this ongoing project, many children came in presenting high levels of Post-Traumatic Stress Disorder (PTSD) symptoms. Caregivers also reported that their children had high levels of PTSD symptoms, as well as other problems like nightmares, feeling scared, feeling worried, or having trouble concentrating in school, feeling lonely, not wanting to play, and having intrusive thoughts. 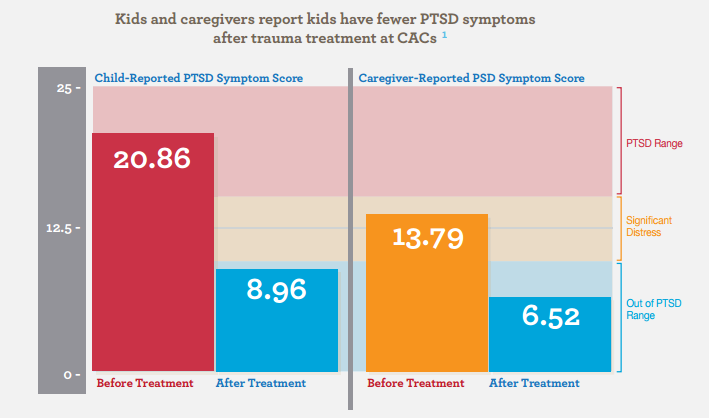 In the chart above3, the Child PTSD Symptom Scale (or CPSS, a common PTSD assessment for kids), shows the average child- and caregiver-reported symptom score before and after receiving the CFTSI therapy. Researchers and clinicians agree that scores of 11 or higher reflect significant distress, and indicate that a child may eventually qualify for a diagnosis PTSD upon further assessment. Children with scores of 15 or higher are almost certain to meet the full criteria for PTSD. Children treated through this program whose symptoms were assessed before receiving CFTSI reported an average score of 20.86. On average, children reported high levels of trauma symptoms at the time they were first seen at the CAC. Following the brief mental health treatment, children and their caregivers both reported much lower levels of symptoms. Children reported with an average score of 8.96, which is below clinically significant levels. Children are usually brought to CACs by caregivers, who will support them in the months and years ahead as they recover from the abuse. NCA provides a standardized tool called the Outcome Measurement System (OMS) to CACs to collect feedback from caregivers and team partners to ensure CACs are doing the best possible job to support children and their families. 580 CACs participate in this program to ensure they are providing the highest quality care to caregivers. Children’s Advocacy Centers (CACs) are child-focused, facility-based programs in which representatives from many disciplines work together to conduct interviews and make team decisions on cases of child abuse. CAC models for child abuse intervention are proven and effective, bringing together trained professionals to investigate and provide medical and mental health care as well as support to child victims of abuse, while holding offenders accountable through the court system. CAC locations are child-focused and designed to create a sense of safety and security for child victims. State Chapters are member organizations comprised of CACs within a given state, similar in structure to NCA. And, like the CACs they serve, no two Chapters are alike. State Chapters exist primarily to support their member CACs, assisting with the development, continuation and enhancement of the CAC model as promoted by NCA Standards for Accreditation. State Chapters also serve as a resource for their member CACs, facilitating a network within the state to support their members and the agencies involved in the investigation, treatment and prosecution of allegations involving child abuse. State Chapters are eligible to apply for accreditation with NCA, in a process that follows a separate set of standards from those for individual CACs. In 1988, representatives from children’s advocacy centers around the country joined forces to establish the National Network of Children’s Advocacy Centers. A decade later, in an effort to reflect the Network’s national composition and focus, the National Network became known as the National Children’s Alliance (NCA). In line with original intent, NCA continues to provide accreditation opportunities, financial assistance, training, technical assistance, research and education to communities, child abuse professionals and the more than 800 children’s advocacy centers throughout the United States in support of child abuse intervention, advocacy and prevention. 4 National Children’s Alliance, Healing, Justice, & Trust: A National Report on Outcomes for Children’s Advocacy Centers, 2016.